Ugly, dirty tile and grout? Don't rip it up. Let Bee-Kleen revive and sanitize your hard surfaces with tile and grout cleaning in Colorado Springs. Regular tile and grout cleaning can save you money in the long run. Regular cleaning extends the life of your hard surface flooring by removing contaminants that can make the grout deteriorate and cause tile to break. In Colorado Springs, tile and grout cleaning should be done at 6-12 month intervals to best protect your investments in tile and stone. "Isn't mopping enough to care for my tile and grout?" Actually, no. Mopping grouted surfaces can do more harm then good. A grouted surface is rough and porous and is prone to contamination. Mopping gives the appearance of clean grout, the the surface holds onto germs that mops are no match for. "What about bleach or strong soaps for disinfecting tile and grout?" Most household cleaners have chemicals that do not pair well with grout. Even mild dish soaps create a residue which attracts dirt buildup and will eventually cause grout to discolor. Bleach is powerful and great for cleaning many surfaces in your home, but not grout! 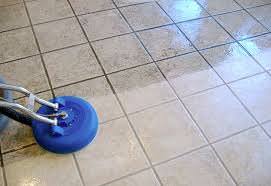 Bleach will cause grout to deteriorate and break apart over time, resulting in costly repairs. "What method does Bee-Kleen use to clean tile and grout?" Bee-Kleen uses a high powered steam method that gently exfoliates grout from the inside out! This ensures that stains and germs are fully extracted from the surface. This approach not only reveals the natural beauty of your surfaces, but is the only way to thoroughly clean and sanitize tile and grout without damaging it. 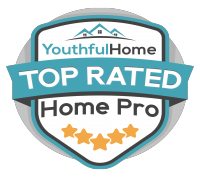 "What's the best way to clean tile and grout between professional visits?" Use warm water and use a soft brush, scrubbing in a circular motion. This method is easy on grout and will not damage the surface in any way.